"Homeschooling is one of our responses to preserve all things Catholic. This is our cross. Let us not come down from such a privileged place. Yes it's hard! But it's a privileged place. And when you are privileged, it's gonna be hard...."
This is just one of the many inspiring quotes from a sermon/talk I have been listening to multiple times this past week. It is long (about 45 minutes), but I can't tell you how much I needed to hear these words of encouragement as we begin our new school year. It has been a challenging week for sure, including moments of frustration and tears (It is hard work home educating a large family, especially with the added challenge of learning challenges and toddlers), but I'm trying my best to love my cross while thanking God for the privileges He has given me... And I am so thankful it is FRIDAY and we all survived our first official week! Don't drag the Cross...Carry it squarely on your shoulder, because your Cross, if you carry it so, will not be just any Cross: it will be... the Holy Cross. Don't bear your Cross with resignation: resignation is not a generous word. Love the Cross. When you really love it, your Cross will be... a Cross, without a Cross. And surely you, like Him, will find Mary on the way. Oh, Jessica! I've had this queued up on my iTouch to listen to for weeks. Thank you for reminding me about it. I'm going to listen to it during dinner prep tonight. I have a feeling it's just what I need to listen to, too. We wrapped up our first week today as well. Stay in your cave!! lol That was an awesome talk. I listened to it twice this week and have it bookmarked and ready to go again. That Josemaria quote is wonderful. I'm going to find a way to share that today. And then I'm going to paint it on my wall. :) Thanks for posting, Jessica! I'm going to listen to that! I feel the pain too...lol. We also have learning disabilities here,,,and toddlers too. My 8yo is having a very hard time adjusting to starting school back up. :( Makes the whole day hard. Love this quote, Debora! Do you know who said it? I completely agree! I, too, would love a wall hanging with the St. Josemaria quote! I is a favorite of mine and I need to remember it daily!!! Beautiful saintly words! God will bless your effort. Remember St. Therese said, "Little things done out of love are those that charm the Heart of Christ… On the contrary, the most brilliant deeds, when done without love, are but nothingness." Not that homeschooling all your little darlings is little in any way, but every little thing you do with love is one step closer to heaven. I think about the privilege to be able to homeschool in the USA - in many countries families are not afforded this privilege. I also think about the privilege to be called to such an AMAZING and INCREDIBLE calling by God - to be called to the care, nurture, education and formation of one of God's very own - to a unique soul that God knew long before he or she was even conceived..... To have the privilege to carry that soul beneath our hearts before birth is humbling, let alone being able to care for and educate and nurture His child...! It never ceases to amaze me to what God has called us to as mothers and homeschooling mothers and families! Is it work? Yes - A LOT! Hard days - OH, YES! Little thanks from "the world" or even one's family or extended family - yes! Learning disabilities and "special" challenges - for many of us - yes. But we would not have it any other way, would we.... 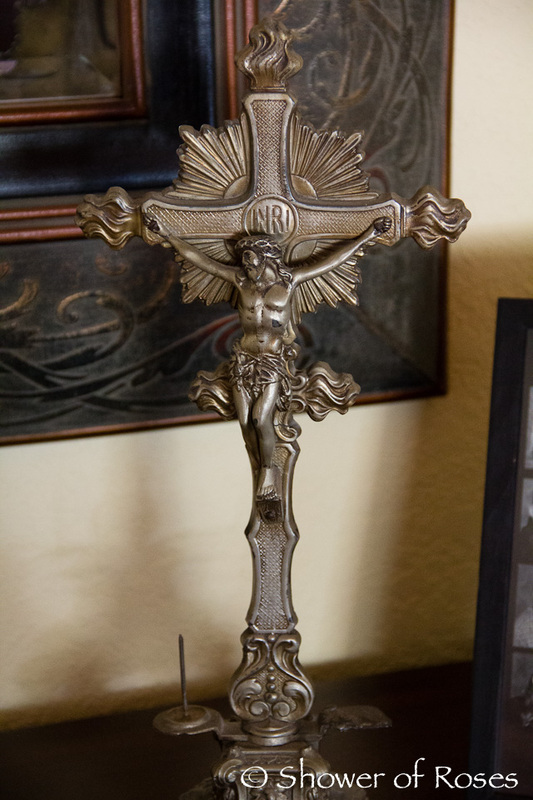 It is a "cross" that we gladly carry because it brings us such joy and will hopefully bring us and our children and families to heaven some day...! God bless, Jessica and all homeschooling families! And isn't it a wonderful thought to know that we are "following in Mary's footsteps" as mothers and home educators?!?!? I listened to this talk too. It gave me encouragement and courage to begin the year. I have eight children 15 months to seventeen so You would think I had this home schooling thing down by now. In reality I was very nervous and fearful of the tremendous amount of effort it would take to get through the school day. I have always been afraid to admit that I don't really like home schooling my kids but I love the results. We do have some very nice days, but most are difficult and long and I'm tired. This talk helped me wrap my head around the nobleness of homeschooling and the beauty of it all. I pray every morning for the gift of sublime resolution....to get up,not worry and get things done. Beautiful, Jessica....I so needed this. Will click over to hear the whole sermon this weekend. I am so glad you posted that sermon. Thank you! I wish I had heard this talk when I was experiencing complete despondency over being able to 'do it all' and I really did feel like the walls were closing in on us. I'll pray for you, your homeschooling in a gift and you share it with all of us so it is an apostolate/ ministry too. I love that quote by St. Josemaria, I think it is time I read more of his work. Fabulous! Many homeschooling families are feeling the Cross, more so as the world tries to dismiss it and the reality of God. Your post has encouraged me to love this Cross, that I believe, will bring about the counter-revolution. I'm all about bringing on the Reign of Mary. Passing this on. Wonderful post Jessica. IM sure these very words and feelings were felt by many over the last 2 weeks. May God grant you and all who choose this vocation of wife, motherhood, and homeschooler the grace each day to carry on. Thank you for sharing this beautiful homily from a very gifted priest! I have never heard a priest speak of homeschooling in such high regard and it captured my heart and cast out those ugly demons, namely, that horrible vice of acedia! STAY IN YOUR PLACE! All for Jesus, through Mary. All for our family, through our vocation. I loved listening today to the talk that you generously shared with your readers. It was very inspiring and it really made me appreciate this new privileged journey that I am on in homeschooling my children. I am very grateful for you and other homeschooling bloggers that post great information to inspire others. You all certainly inspired me and moved me(along with a lot of prayer) to take the plunge into homeschooling. Even with all of the crazy days(we started in June), it has been soooo worth it! After seeing my children in public school, parochial school and now our homeschool it is just amazing the transformation that is occurring in my children and in our home life. Being able to home school is such a blessing and I am thankful for people like you saying "yes, you can do it! ", even when others around me think I am crazy! God bless!